Available with either 2.8mm or 6.3mm connectors. SKU: wk05. Category: Wiring Kits and Harnesses. 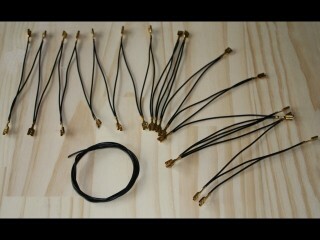 This is a group of daisy chained wires for use on illuminated buttons. The wiring is provided as a single “chain” with 30 connectors, which will give you enough connections to wire up the positive and negative terminals of up to 15 pushbuttons. We also include 3 metres of additional wire to act as lead wire to hook up to your power source, or bridging wire if you have a little distance from one pushbutton to the next. 30 daisy chained female quick connector terminals (available in either 2.8mm or 6.3mm) with 12cm of black wire separating each connector.